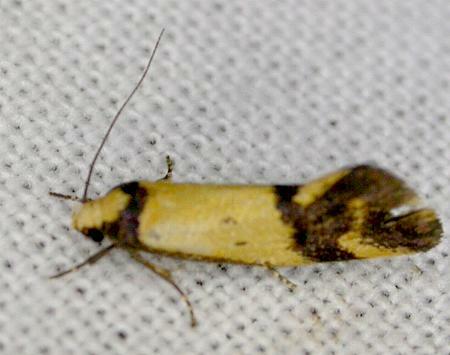 The adult moth has yellow forewings, each with two, sometimes joined, metallic dark brown bars. The hindwings are brown, darkening towards the wingtips. The wingspan is about 2 cms. CSIRO Publishing, Melbourne 1994, pp. 24, 29, 95, 96. Series 1, Volume 10, Number 4 (1886), p. 832, No. 519 (41a).